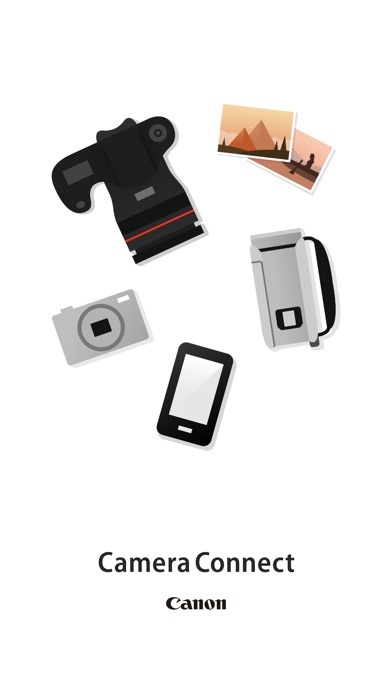 Canon Camera Connect is an application to transfer images shot with compatible Canon cameras to smartphone/tablet. 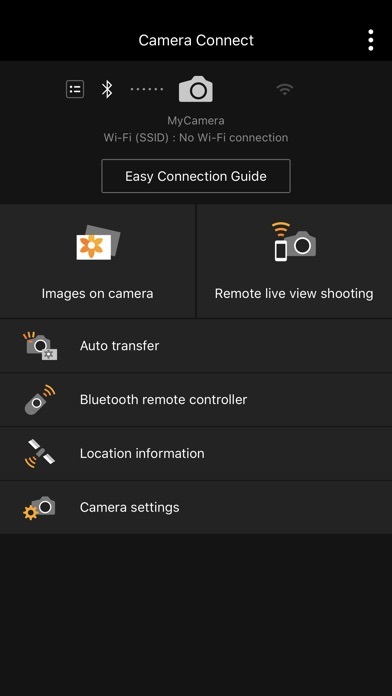 By connecting to a camera with Wi-Fi (direct connection or via wireless router), this application provides the following features: ・Transfer and save camera images to a smartphone. ・Remote shoot with live view imaging of the camera from a smartphone. This application also provides the following features for compatible cameras. 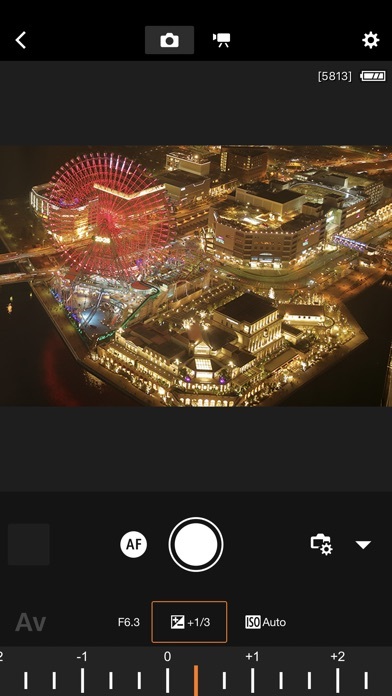 ・Acquire location information from a smartphone and add it to the images on the camera. ・Switch to a Wi-Fi connection from pairing status with a Bluetooth enabled camera. ・Remote release of the camera shutter with a Bluetooth connection. *For compatible models and features, please refer to the following website. 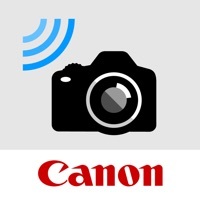 https://global.canon/icc/ -Operating System iOS 10.3/11.4/12.1 -Bluetooth System Requirement For Bluetooth connection, the camera needs to have a Bluetooth function, and your device needs to have Bluetooth 4.0 or later (supports Bluetooth Low energy technology). -Compatible File Types JPEG, MP4, MOV ・Importing original RAW files is not supported (RAW files are resized to JPEG). ・MOV files shot with EOS cameras cannot be saved. ・AVCHD files shot with Camcorder cannot be saved. -Important Notes ・If application does not operate properly, try again after shutting down the application. ・Continued use of GPS running in the background can dramatically decrease battery life. ・In the case of using Power Zoom Adapter, please set the Live View function to ON. ・The images may include your personal information such as GPS data. Be careful when posting images online where many others can view them. ・Visit your local Canon Web pages for more details. Not sure why everyone dislikes this app, I love it! So convenient and a must for anyone with social media! What is the point of having an app that does not work?!?!? I just bought my Canon PowerShotSX530 HS and the app was working fine now it’s not working at all! What the hell???? Are there any other options besides this piece of junk???? Terribly difficult to switch between smartphone and a laptop. I can’t stop using canon because of the glass I have, but if I could, I would. I can’t set up my camera it’s a PowerShot ELPH 180 but in stead of 180 they have 190 and it is so annoying. Used to use this on my iPhone7. I now have an XS Max and it doesn’t work. It’s been days and I have yet opened the app for my new camera I just purchased. The app keeps crashing every time I click it. Redownloaded multiple time and on different devices, and still no luck. Please update this app. I had downloaded this app several months ago and everything was working fine connecting my Canon EOS Rebel T6i to my iPhone via Wi-Fi ... until I switched carriers from Sprint to AT&T. Now it wants a password to connect and I don’t ever remember having to enter one. I am now locked out! I cannot find any information on how to do a reset. The app is now useless to me. Grrrrr!!!! This app is basically useless. When you can finally get the app to connect to your phone it will drop randomly. Very unreliable. The last update, whatever it was, made it essentially useless. I bought this camera specifically to be able to use with the app and based on the type of shooting I do I am very reliant on the app functioning. Recently the app has stopped functioning and there is a very long lag in the images shown on my phone and it no longer automatically connects to my camera. I tried calling customer support and while the support agent was very nice, he had no information on his end regarding this issue or estimated timing of a fix. He actually started the call telling me it was a user error on my end and then finally by the end of the call said he had another call on a similar issue so perhaps it was an app issue. But again, he had no documentation on the specific issue or a fix in progress. So overall it feels like canon is not committed to support of this product and ultimately that has a huge impact on whether I am able to use the expensive camera I purchased as intended. So far, the only reason I have for using this app is to geotag photos I take with my new (to me) PowerShot S120. It seems to work but everything about the experience is awkward. I have to remember to launch the app and start logging my location, and then, later, connect the camera and phone via WiFi and tell the app to update the photos on the phone with location info. These steps could be streamlined. Toggling GPS logging should be accessible from the main screen, for example, rather than a click deep. Also, any time the camera is connected to the app, it should automatically update GPS info on any stored photos. Even within the existing interaction flow, the UI could be more clear, the help text easier to understand, the superfluous confirmation dialogs less prevalent. I’ve tried using it to transfer photos directly to my phone to share with people and it is more tedious than it should be. Bad news is that there really isn’t any other choice; good news is that you don’t have to waste time looking! I spent hours trying to connect this app to my camera after getting connected only one photo downloaded before both camera and app froze. Attempts were made on both my iPhone and my iPad with no success, this app is worthless. It won’t connect with my EOS 77D through Bluetooth. It sends me in a loop through the setup process. Seems Canon is a big enough company to invest in a functioning app. I have a Cannon EOS Rebel T7i camera. This app used to connect to it via WiFi, but now it will no longer connect at all. I’ve tried everything, and it seems it’s a software issue/bug with the app. This seriously needs to be addressed. 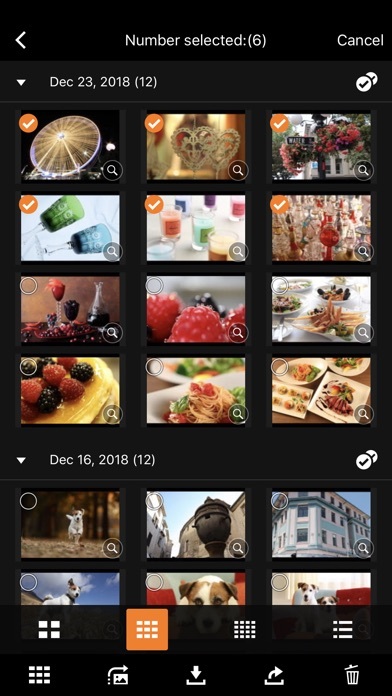 One of the reasons I chose the T7i was for the ability to seamlessly connect my iPad or iPhone to my camera, download the pictures, and edit them. I’ve also noticed that the developers for this app hasn’t even responded to anyone having issues. The least you could do is respond to these reviews and let people know you’re aware of the issue, and if there is a fix in the future. I love being able to just connect my camera to my smart phone and save videos from there without hassle, but I’m very very upset that I can’t save videos! I was very excited thinking I would be able to save videos in high quality that I recorded with my camera but I can’t. I really hope they fix this PLEASE FIX THIS!!!!! Worked for about the first week, but now crashes every time is connected to a camera. Terrible latency for remote photo shooting (for the few seconds its not frozen or crashing), and I can’t get the pictures from my camera to my phone. Works well for what it does, but I’m constantly having to relaunch the app on my iPhone 8 because it gets kicked out of memory, even though Background App Refresh is on and my M50 is set to “maintain connection when off”. I did not have this problem on my iPhone 6S, so I’m not sure who or what is at fault, but it’s very frustrating to be shooting for awhile and then realizing that none of those shots are geotagged because the app unpaired again. It’s not ok that I can’t get raw files to iPad from camera wirelessly. App is no better than older version. Add support for raw. This is beyond just difficult to master, it flat out does not work. I am a computer professional by trade, and I deem this to be pretty useless. I am sorry, Canon, I like your products generally but you can really do better than that. This app doesn’t download the videos I take on my Canon EOS 70D to my iPhone. I get this format cannot be played error. It doesn’t even download so I can use a different app to convert them to view them on my phone. I hoped that I can use better camera to take videos and share with friends and family. But you can’t do that. It used to work, but it doesn't anymore. All I want is to import RAW files wirelessly. I’ve had lots of challenges getting the app to connect and now it won’t connect with my camera at all. Every time I open the app it closes itself before I have a chance to do anything. I’ve tried uninstalling and reinstalling, turning camera on and off, and it’s not working. Very irritating. Below is my original review. This review on the top is current. I’ve been using this app for a long time and never had an issue. Today after I used it to connect to my iPad and download Photos there, I’m suddenly left with hundreds of empty albums that are marked EOS. One album has the photos that I downloaded today from the app, and I have no idea where all the other albums came from. I am not able to delete them all at once, I can only delete them one at a time which I am not going to do. Never had this problem before, hopefully Canon will update the software and take care of this issue or maybe reply to some of us here with a fix. This app is great to use. I use the remote shooting feature to photograph hummingbirds when I have my camera on a tripod. I leave the camera set up, and I can sit in the shade watching the iPad screen. When the hummingbirds show up, I can photograph them remotely, eliminating camera shake, as well as keep my distance so I won't scare the birds off. Can also change settings on the camera remotely such as AF, etc. Also great for quickly transferring photos right to my iPad. Camera Connect is brilliant. works perfect for pictures, i just wish you could upload videos as well. Works fine with my 6D usually, photos are slow to download to my phone sometimes. Connecting to more than one iOS device can be tricky. But my biggest issue is that it has created thousands of empty photo albums on my phone! There’s no way to get rid of all of them. This app was clunky, but mostly worked. Last update created thousands of empty albums. Great job Canon, why do you even bother. Doesn’t work at all and creates more problems than fixes. First the app says there’s a logging feature for location but then when I try and add it to pics it says it’s not comparable with my camera, why waste my battery if I can’t use it?!?!? Next problem I want to import photos, doesn’t work though nothing imports but the app created hundreds of albums in my photos library with the camera name and no photos in it and I now have to waste my time fixes all the problems this horrid app caused. Thanks for nothing but cussing me a headache. I chose this camera cause it had an app with these features didn’t know it was all a lie. I downloaded the app on my iPhone and it opens and immediately closes. I tried restarting my phone, and then deleted and reinstalled the app a couple of times, but it still won’t open. Any ideas? I’ve only used the app to transfer pictures from my camera, which works fine. I now, however, have hundreds of empty albums in the photos app named “Canon PowerShot SX70 HS”. This app USED to work. Over the last 3 months, I have made numerous attempts to connect it to my camera to no avail. Worked perfectly up until Nov. 2018, then the connections started to fail. Customer service response has been non-existent! Got it to work on WiFi but gave up on Bluetooth. Crashes when I try to use it with BT.